Gentiana acaulis, thy stemless gentian, is a species of flowering plant in the family Gentianaceae, native to central and southern Europe, from Spain east to the Balkans, growing especially in mountainous regions, such as the Alps and Pyrenees, at heights of 800–3,000 m (2,625–9,843 ft). It is a perennial plant, growing up to a height of 10 centimetres (3.9 in) tall and forming a "mat" up to 50 centimetres (20 in) wide. The leaves, which can be lanceolate, elliptical or obovate, are evergreen, 2–3.5 cm long, in a basal rosette, forming clumps. The trumpet-shaped terminal flowers are blue with olive-green spotted longitudinal throats. They grow on a very short peduncle, 3–6 cm long. The flower stem is often without leaves, or has 1 or 2 pairs of leaves. It likes full sun, is fully hardy and flowers in late spring and summer. This plant, like others of its genus, is valued in cultivation for the unusually pure intense blue of its blooms. It has gained the Royal Horticultural Society's Award of Garden Merit. The Latin specific epithet acaulis means "short-stemmed". The closely related Gentiana clusii, often called by the same common name as this species, differs by growing on limy soils. It also has shorter leaves and the flowers have no olive-green stripes. A depiction of a gentian flower can be seen on the obverse side of Austrian € 0.01 euro coins. ^ a b T. G. Tutin; V. H. Heywood; N. A. Burges; D. H. Valentine; P. W. Ball; S. M. Walters; D. A. Webb (1972). Flora Europaea. 3. Cambridge University Press. p. 62. ^ W. A. Clark (1907). Alpine plants, a practical manual for their culture. Рипол Классик. p. 55. 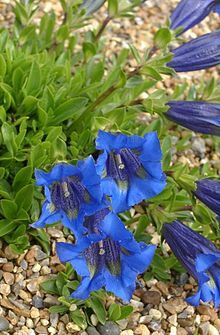 ^ a b c "Gentiana acaulis AGM". Royal Horticultural Society. Retrieved 27 July 2013. ^ "AGM Plants – Ornamental" (PDF). Royal Horticultural Society. July 2017. p. 42. Retrieved 27 February 2018. ^ "1 Euro Cent - Austria". numista.com. This page was last edited on 14 January 2019, at 20:08 (UTC).